About 90-95% of people with diabetes have Type 2 diabetes, which is the type that’s often preventable with lifestyle changes. Fan Yang, MD, works with patients of all ages at Healthville PLLC, where she creates individualized plans to prevent diabetes and provides ongoing support and disease management to those diagnosed with the disease. If you’d like to learn whether you’re at risk for diabetes, call the office in Little Rock, Arkansas, or book an appointment online. Diabetes develops when your pancreas either stops producing insulin or doesn’t make enough insulin. Insulin’s job is to get sugar out of your bloodstream. Without enough insulin, blood sugar levels get too high, and this can lead to serious health problems. Type 1 diabetes is usually diagnosed between the ages of 4 and 14, but it can occur at any age. In this type of diabetes, your pancreas doesn’t produce insulin. Type 2 diabetes is most commonly diagnosed in adults, but it also develops in older children and young teens. When you have Type 2 diabetes, your pancreas produces insulin, but not enough to keep blood sugar levels normal. Most patients with Type 2 diabetes also develop insulin resistance, making it so they can’t utilize the insulin that’s available. What health complications develop from diabetes? Over time, high blood sugar damages small blood vessels and nerves. Damaged blood vessels increase your risk of developing heart disease and kidney disease, while nerve damage affects your eyes and causes pain or numbness in your feet. In patients with Type 1 diabetes, symptoms develop quickly, becoming evident over the course of a few weeks. By comparison, symptoms take years to develop in those with Type 2 diabetes. 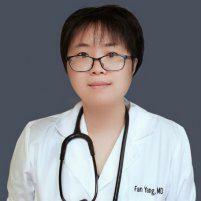 Dr. Yang does a urine analysis to screen for diabetes. He also performs hemoglobin A1C blood tests to diagnose the disease and to monitor your blood sugar levels. Patients with Type 1 diabetes must take insulin and regularly check their blood sugar. If you have Type 2 diabetes, you may need insulin or another type of medication that lowers blood sugar. Everyone with diabetes learns to control their blood sugar by monitoring the amount and type of carbohydrates they consume. If you have Type 2 diabetes, changing your diet and losing weight if needed may be enough to keep your blood sugar at a safe level. To learn more about diabetes or to schedule diabetes screening, call Healthville PLLC or book an appointment online.